The history of backgammon is long, complicated, very incomplete — and fascinating. The exact origins of the game remain unknown, though there is much conjecture, a good deal of it both ingenious and farfetched. Backgammon is a dice game, and dice games seem to have developed in every part of the world. At first tribal priests rolled the bones of animals to predict the future but since predicting the future is at best a hazardous business, it wasn’t long before people began to roll the bones and bet on the outcome. It is not hard to see how dice, our modern “bones,” evolved. Our primitive ancestors may have carved four, eight, twelve, or twenty faces on their gambling bones, but there are two good reasons why the six-faced die — with numbers or pictures on each face — evolved fairly universally. The first is that it is rather easy to build a cube. The second is that the cubic form is best for rolling; a pyramid tends to stop fast when it hits, and an octahedron or a form with even more faces tends to roll too much. Once dice had been invented, the next step was to use them to move game pieces around a game layout. Games of this kind seem to have developed everywhere and some may be early ancestors of backgammon. The most ancient possible ancestor of the game to be found so far dates back some five thousand years to the ancient civilization of Sumer which flourished in southern Mesopotamia in what is now Iraq. During the 1920s Sir Leonard Woolley, the British archaeologist, excavated Ur of the Chaldees, the Biblical home of Abraham. In the royal cemetery he found five game layouts which bear some slight resemblance to our backgammon boards. They were made of wood, intricately decorated with a mosaic of shell, bone, lapis lazuli, black paste, and black limestone set in bitumen, and adorned with animals and rosettes. Soon after Woolley’s discovery, in another part of ancient Mesopotamia, archaeologists found a similar gaming board. This one was less lavishly decorated, but under the board, in neat piles, were found two sets of playing pieces and dice. One set of men consisted of simple black squares, each inlaid with five lapis dots; the others were shell squares engraved with vignettes. Each player apparently had seven men and six dice. 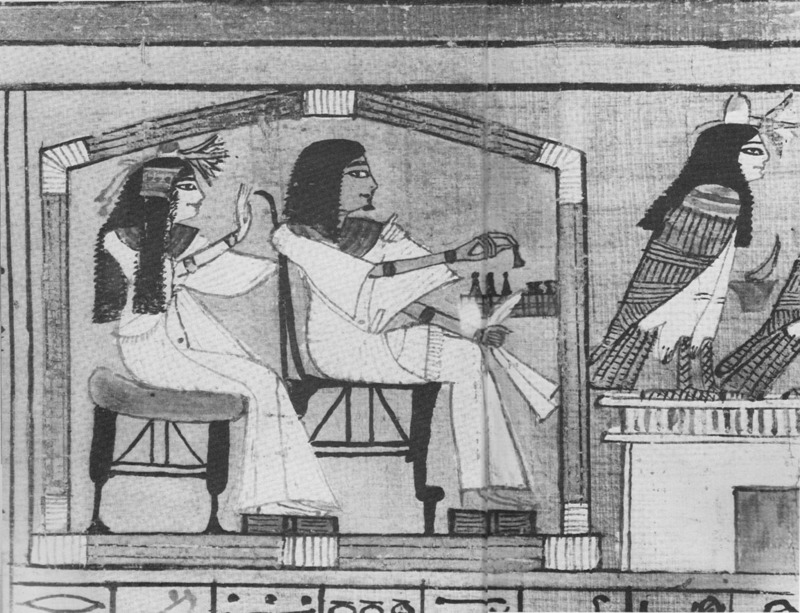 There is evidence that several thousand years later the Egyptian Pharaohs were enjoying another board game that may be an ancestor of backgammon. Boards dating from 1500 BC. were found in King Tutankhamen’s tomb in the valley of the Nile, and even at Enkomi on Cyprus, then an Egyptian colony. One board contains Queen Hatshepsut’s name, and with the board were found lion-headed pieces, the ancient symbols of royal power. 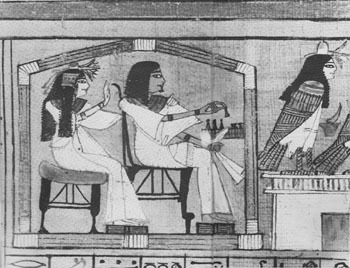 Wall paintings in many Egyptian tombs portray people playing the game, suggesting that it was played by common people as well as by the aristocracy. The Trictrac Players. Painting by Willem Duyster, Dutch; about 1625–30. 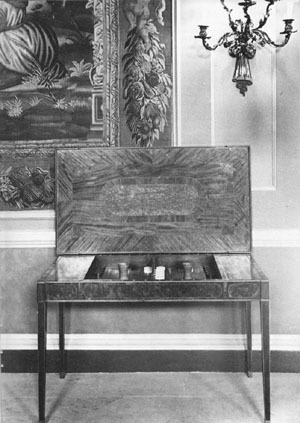 However much the Egyptian game differs from what has evolved into modern backgammon, the Egyptians had one bit of equipment we might envy; a mechanical dice box. The dice were put into it, shaken up, and thrown out onto the table. Like everyone else, the ancient Egyptians played their game for money and invented this machine to guard against cheaters (always a sign of higher civilization). The Greeks and Romans later adopted this device in their versions of the game. But where did the first versions of backgammon originate? We don’t know and may never know; a reasonable guess would be India or China, the two civilizations we have inherited most games from. Each produced a game of pure skill. The Indian game was chess. 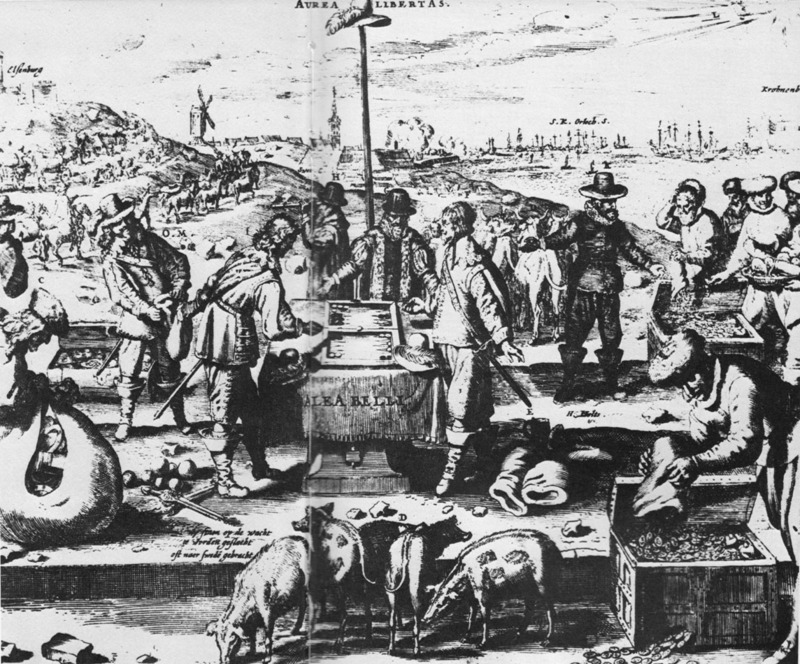 The Chinese played a version similar enough to show that there must have been commerce across the Himalayas. But the connection between either version of chess and backgammon is tenuous indeed. There is, however, sufficient similarity, between backgammon and another ancient Indian game, parcheesi, to suggest the latter as a possible remote ancestor. 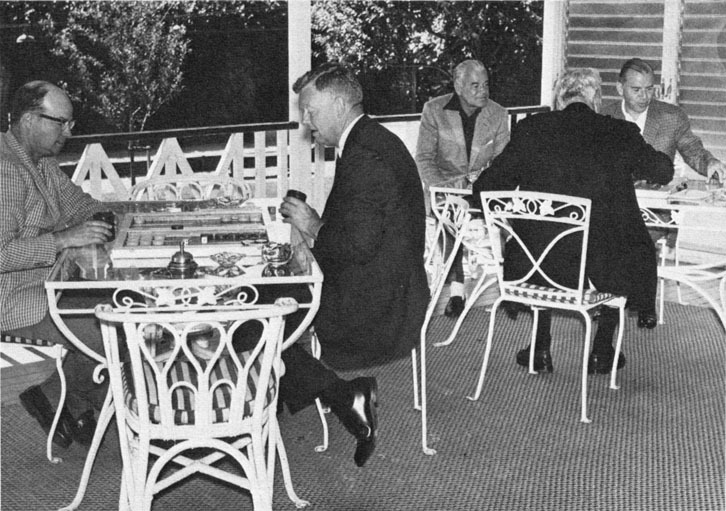 Parcheesi is primarily a four-person game, played on a board, in which each player has several identical men. 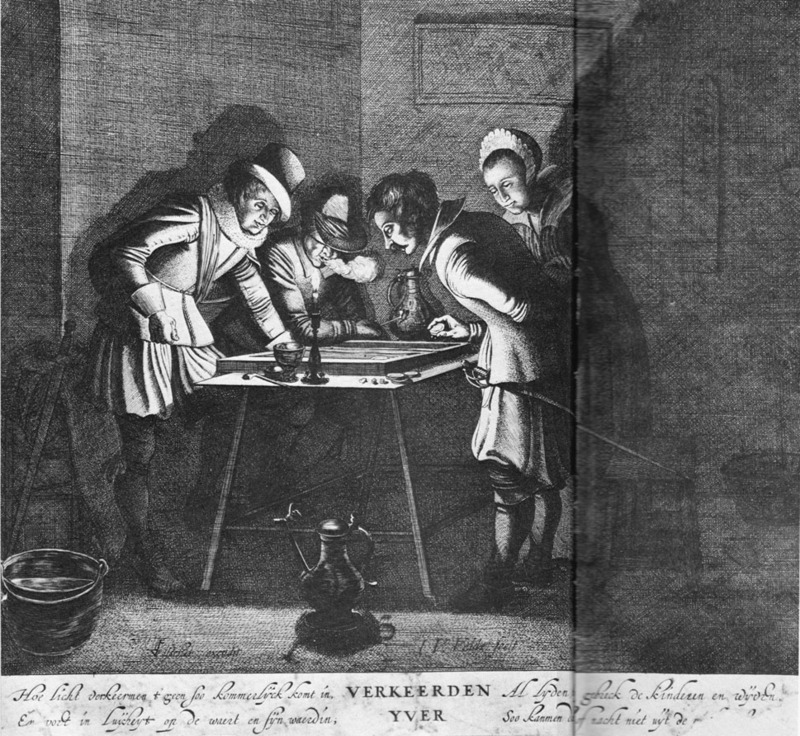 Unlike modern backgammon, the men start off the board (as they do in the Navy game of acey-deucy and in some other forms of backgammon). 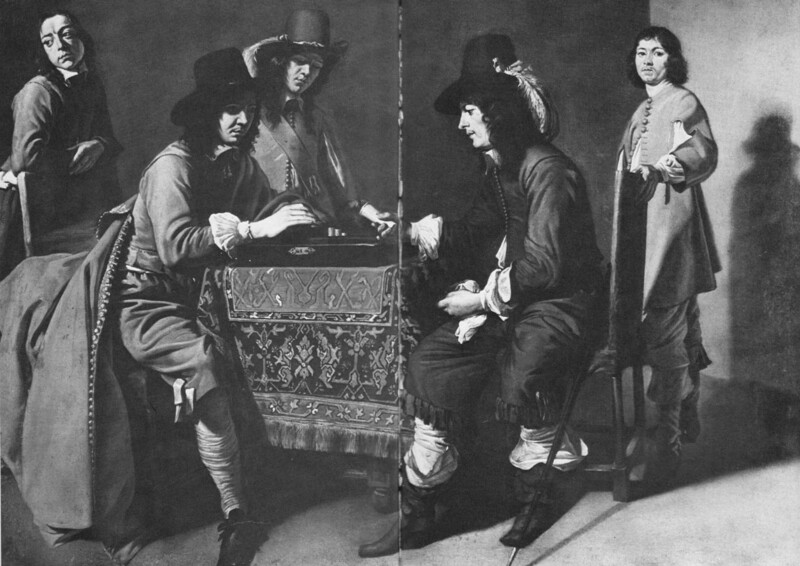 In parcheesi a player who rolls a doublet makes his play and then takes an extra roll; in acey-deucy a player who rolls an ace-deuce (1-2) plays it and any double he wishes, and then gets an extra roll; in backgammon a doublet number is played four times, which is the same as two plays. 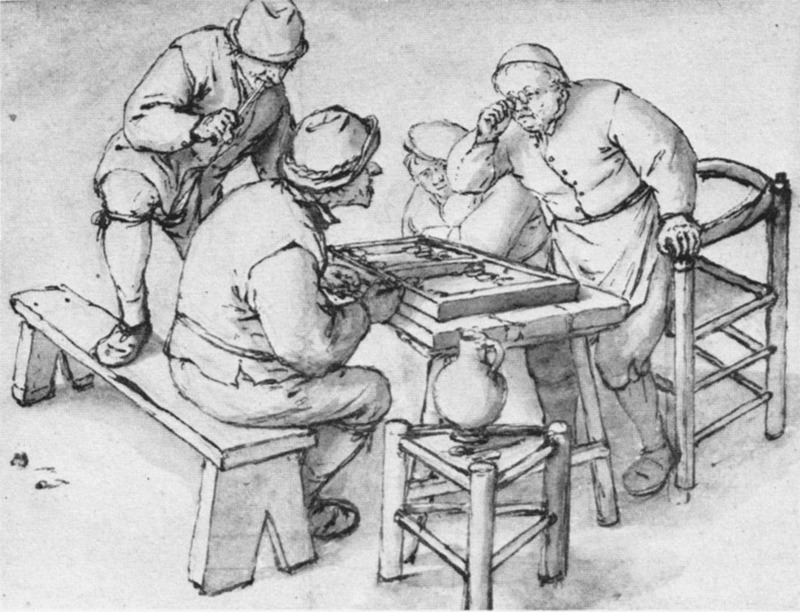 Backgammon players. 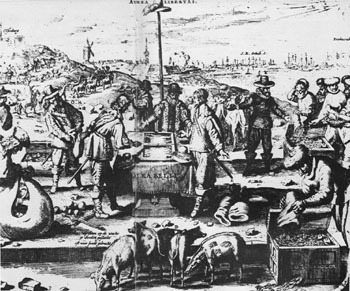 Engraving by Van Velde. The object in parcheesi, as in backgammon, is to “bear off” all your men from the board, and in both games a player must bring all of his men into his home sector before be can start to bear them off. Further, in both games a single man or “blot” is a weakness since an opponent can play to that point and send that man off the board. And in both games two or more men on a point are very strong; in parcheesi even more so than in backgammon, since an opponent may not even pass such a point. 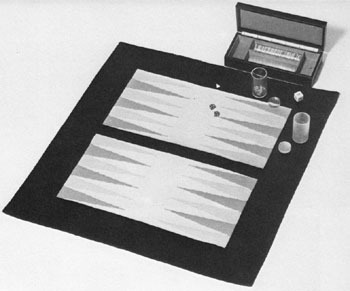 A number of versions of backgammon can be found throughout the Far East. In China there is the game called shwan-liu. In Japan they play sunoroku, which omits the bar. In Korea they play ssang-ryouk; in Thailand, len sake or saka; and in Malaya, main tabal. But the game must have reached Western Europe from the Mediterranean. A thousand years after the Egyptians were playing their version, the Greeks, or at least the patrician Greeks, were playing a form of the game. Plato mentions a Greek form of the game and comments on its popularity. Sophocles attributes its invention to Palamedes, who was said to have beguiled away the time during the long siege of Troy by playing it. Homer mentions the Greek game in the Odyssey. Herodotus claims that the Lydians invented it. In Rome the game long remained one of the most popular among the patricians. It rivalled the Circus Maximus as a pastime and was regarded as the sport of emperors. Indeed, the excavators of Pompeii found a backgammon table carved in the courtyard of almost every villa. The game had three names in Rome and was apparently played with three dice instead of our two. It was called “alea,” or dice; “tabulae,” or tables; and the more descriptive name of “ludus duodecim scriptorum,” the twelve-line game, for the twelve points on each side of the board. Though Julius Caesar may have said “Alea jacta est” (the die is cast) when he crossed the Rubicon, there is no evidence that he played any particular dice game. Other Roman emperors did, however; one even had a special room in his palace designed for dicing. And according to Suetonius, the emperor Claudius was so fond of the game that he wrote a book on it — and had a table mounted on his chariot so he could play while travelling! There are also records that say Domitian was an expert player — and that Caligula was a cheat. And there are reports, fanciful or otherwise, that Marc Antony played ludus duodecim scriptorum with Cleopatra. Nero, among his other excesses, is said to have played the game for as much as the equivalent of 15,000 dollars a point. The emperor Commodus is reported to have turned the imperial palace into a grandiose gambling casino. Indeed, it is recorded that at one point he was losing so badly that he appropriated a large sum from the imperial treasury, ostensibly to finance an expedition to the African provinces, promptly went back to the tables, and lost every cent. At Pompeii a fascinating wall painting was found portraying a backgammon tale in two scenes. In the first, two players are arguing over a game in progress; the second depicts an innkeeper throwing the two fighting opponents out of his establishment. So the game was apparently enjoyed by ordinary Romans as well as the aristocracy. 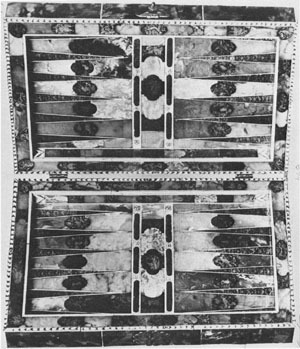 A backgammon board inlaid with masked columns and sea horses. 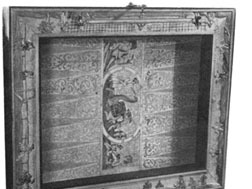 Each of the twenty-six draughtsmen is carved in relief with a flower. 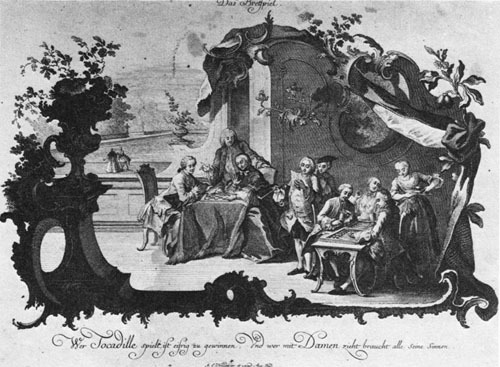 German (Eger); late seventeenth century. The Roman legions must have brought tabulae with them through Europe. But except for the fact that the name survived in Britain as “tables,” it does not appear that Rome’s conquered lands were immediately receptive. It seems to have been the return of the Crusaders that effectively spread the game throughout Europe. At least one form of backgammon was played in the Middle East long before the Crusades. The source may have been ancient Sumer, Egypt, India, or all three, but the game the Crusaders encountered among the Saracens — and enthusiastically adopted — was called nard or nard-shir. 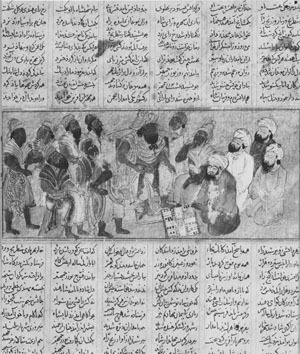 The Arabs had learned the game from the Persians, and it was supposedly named after Ard-shir Babakan of the Sassanid dynasty of the ancient Persian empire, who was said to have invented it. Using two dice instead of the Roman three, the game was played on a chequered cloth that contained twelve divisions corresponding to the solar months of the Persian year. 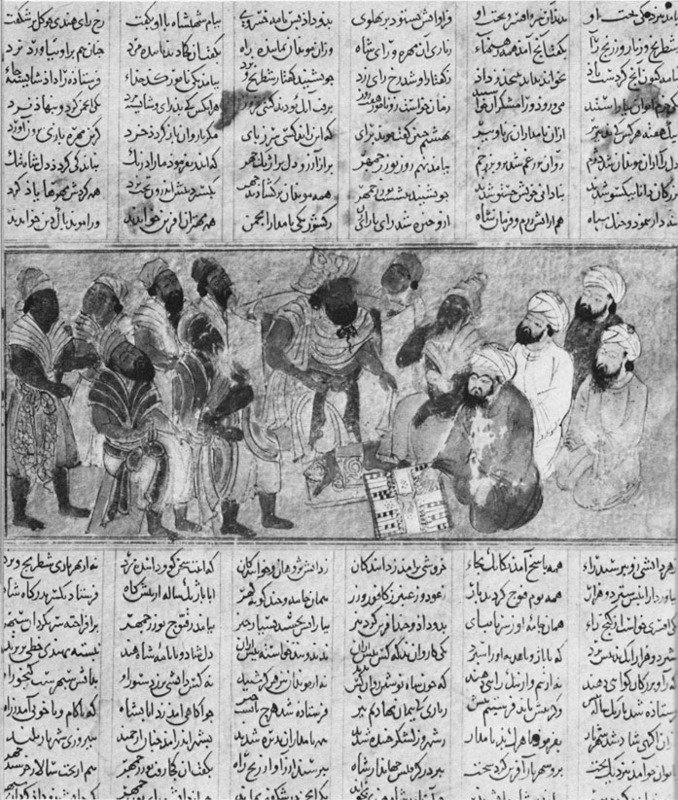 The total number of men, or muhrahs, corresponded to the number of days in the lunar month; half the counters were black and half were white, since during half the month the nights were dark and during the other half the nights were brightly lit by the moon. The names of the seven points in the game were richly suggestive: Kad (quantity), Ziyad (growth), Satarah (fortune, curtain or veil, or star), Hazaran (thousands), Khanah-gir (possessor of the house or chamber), Tawil (tall, or long), and Mansubah (scheme, plan, or game). 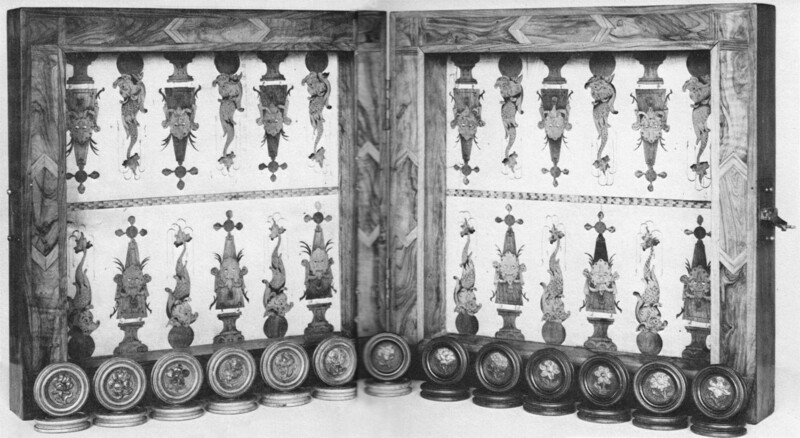 Various early versions of backgammon seem to have been popular in Britain. Though the game was known in Anglo-Saxon times and is mentioned in old English glossaries of the eighth and ninth centuries, its great popularity apparently dates from the Crusades. 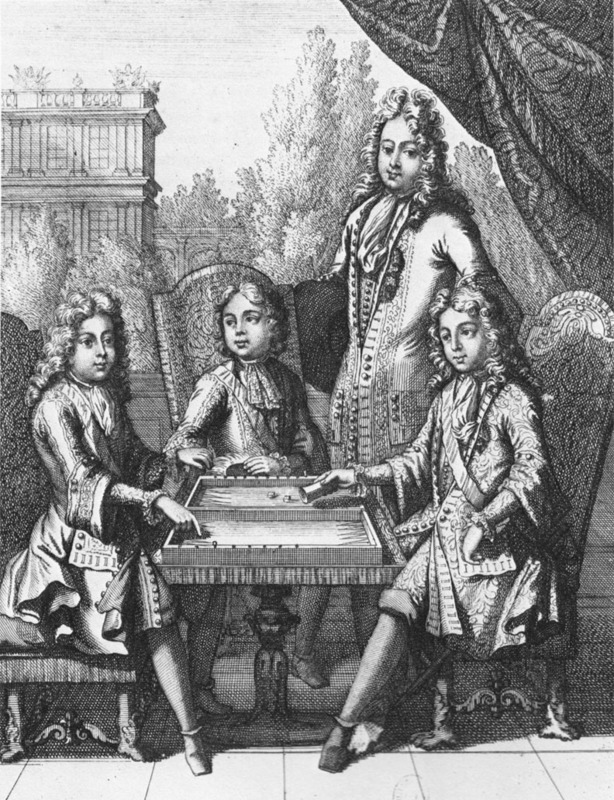 The three Royal Princes of France playing trictrac; their father, the Dauphin, watches. Engraving by Bonnart, Paris, 1693. Richard’s brother, King John, also liked to play the game, which by now had acquired its English name “tables,” after the Roman tabulae. King John played his court favourites for modest stakes, if he lost, the amount was faithfully noted in the record of his daily expenses. It remained a favourite game of the upper classes in Europe throughout the middle ages. Robert of Gloucester’s thirteenth-century chronicle portrays knights playing “atte tables,” and there is a similar passage in the Song of Roland. Tables spread from the upper classes throughout medieval society in Europe. 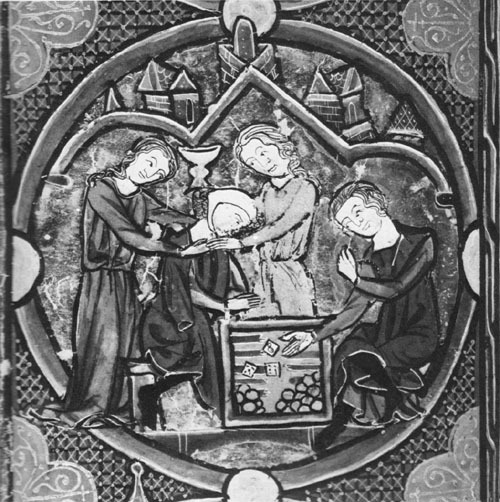 Innkeepers attracted customers by providing them with boards, men, and dice, Apparently the medieval board was twice the size of the usual chessboard, and the men were larger than our modern playing discs. The Church, which of course did not approve of any kind of gambling, waged a long and losing war against the popular game. In 1254 Louis IX of France (Saint Louis) forbade the game to his court officials and extended the ban to all his subjects. One hundred and fifty years later the Archbishop of Tournai was busy prosecuting people caught playing tables. The schools of Bologna decided that ecclesiastical canons did not apply to chess — but tables was still classified with the “inhonesti ludi” (dishonest, or dishonourable, games), and attempts to suppress it continued until the end of the fifteenth century. By then, towns in France, Italy, Spain, Switzerland, and Holland were exempting tables from municipal censure so long as the stakes were kept small. 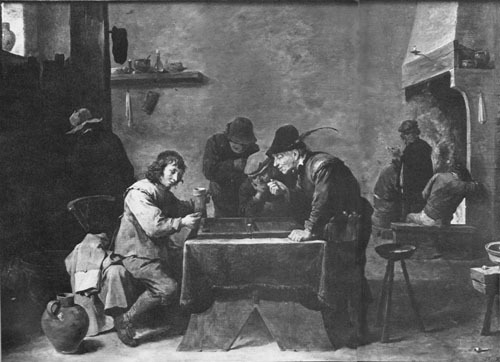 However, the game remained forbidden to university students and apprentices learning their trade. In Spain and England the game emperador, or the English game, stands out as the leading variety of tables, in Germany buf, in the Low Countries and Scandinavian countries verkeer or kotra. … Testa was the game most frequently played in Italy. … In France trictrac, which has a certain resemblance to the Spanish laquet, came to the front from about 1500. The most interesting of these games is emperador, because both in Spain and England there were special terms for different ways of winning comparable to the distinctions made in modern backgammon between the win, the gammon, and the backgammon. In Spain, the blocking of six consecutive points gave the winner barata; in England there were two special wins known as limpolding and lurching. We suspect that, in mentioning “lurching,” Mr. Murray, may have confused backgammon and cribbage boards. Though cribbage is a card game, the score is kept by moving pegs around the board as points are made. The first man to score 121 wins, and if his opponent’s more advanced peg has not yet reached the home board (the last 30 holes), the loser has been “left in the lurch,” or “lurched,” and loses double the stake. 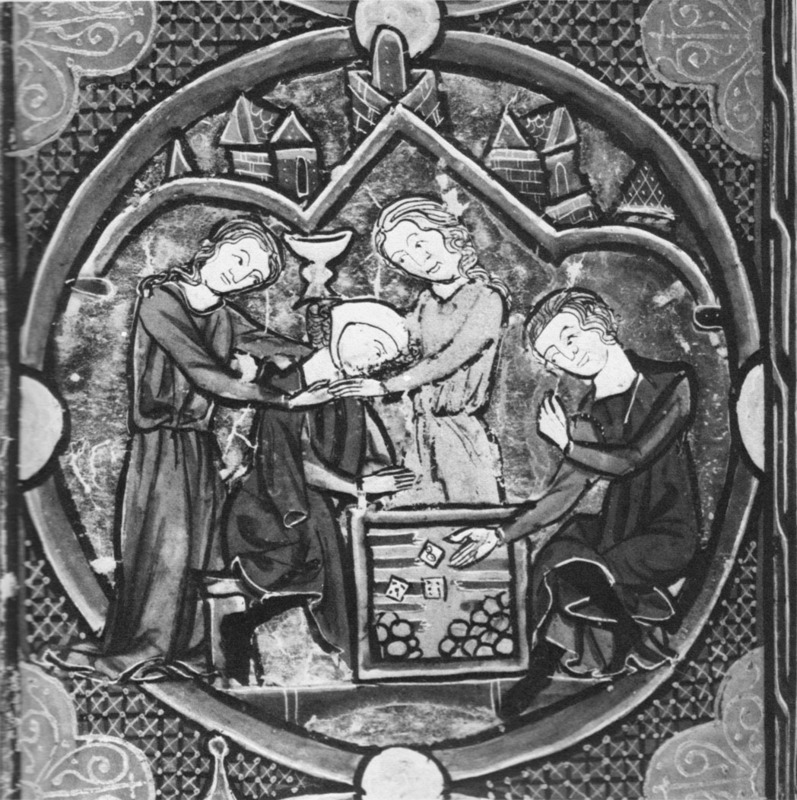 The modern board appears in pictures in Europe as early as the fourteenth century, and after that widely throughout the continent as the game flourished and spread. 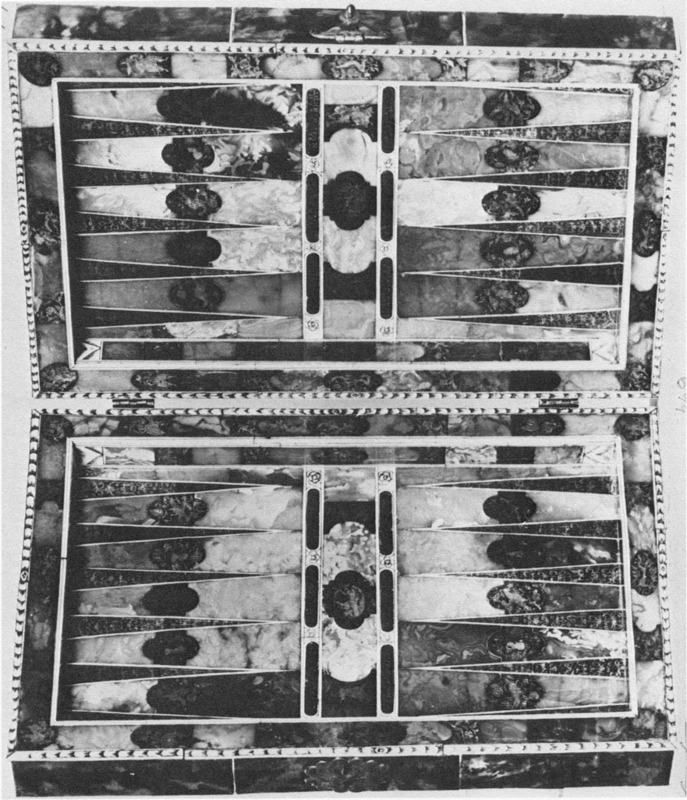 Very ornate boards survive from this period, and even church decorations — some of Germany’s medieval cathedrals contain depiction’s of backgammon boards. And there were many treatises and illuminated manuscripts to explain the game. There are many methods of playing at the tables with the dice. The first of these, and the longest, is called the English game, Ludus Anglicorum, which is thus performed: he who sits on the side of the board marked 1–12 has fifteen men in the part [point] marked 24, and he who sits on the side marked 13–24 has a like number of men in the part 1. They play with three dice or else with two (allowing always [a roll of] six for a third dice). Then he who is seated at 1–12 must bring all his men placed at 24 through the partitions from 24 to 19, from 18, into 13, and from 12 to 7, into the division 6–1, and then bear them off his opponent must do the same from 1 to 7, thence to 12, thence to 18, into the compartment 19–24; and he who bears off all his men is conqueror. A Louis XV gaming table with concealed backgammon board. The playing surface (lower view) is of ebony, with points of dyed ivory. 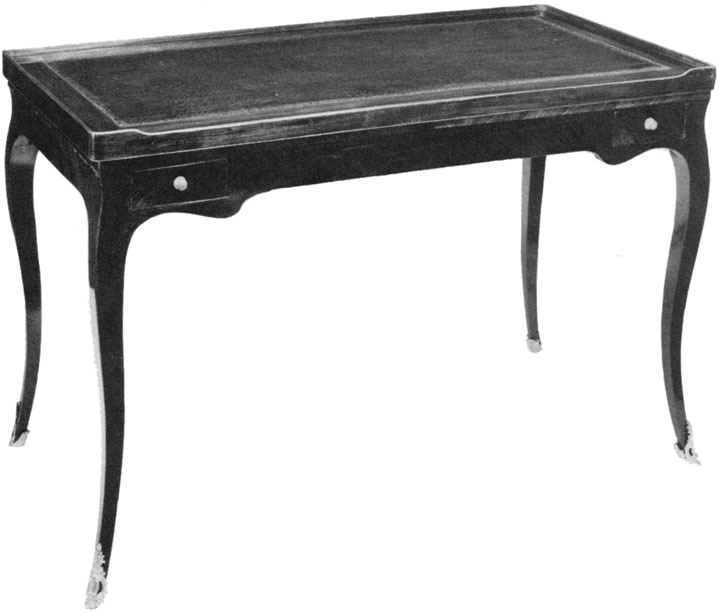 The table is cross-veneered in figured mahogany, the rim is decorated in brass, and the legs terminate in finely chased bronze doré. The table is unusual in that the top (upper view) is made with one edge lower so the piece may be used as a bureau plat (flat desk). The drawers are placed on each side of the desk, the right one being fitted with compartments for inkwell, sander, and writing accessories. 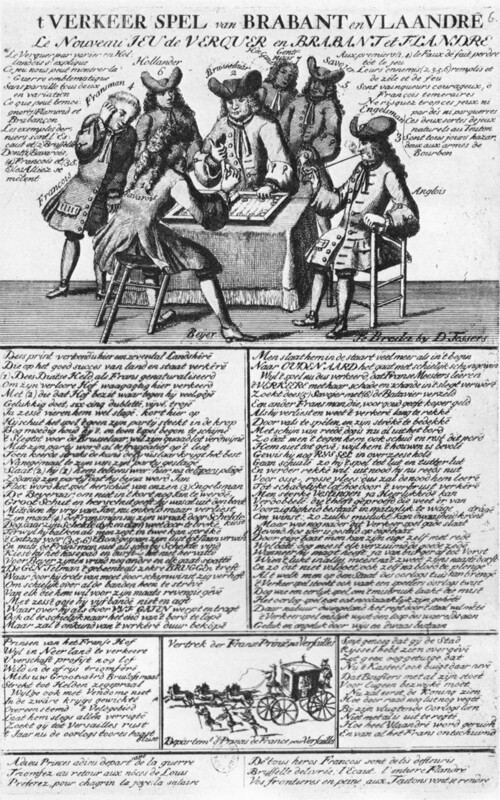 The same treatise goes on to describe other variations of tables, including Paume Carie, played with two dice and four players. At least Northbrooke recognised that tables was a game of skill, and perhaps his attitude was more liberal than it looks, since as recently as 1526 Cardinal Wolsey had decreed that all tables, dice, cards, and bowls were illegal and should be burnt. 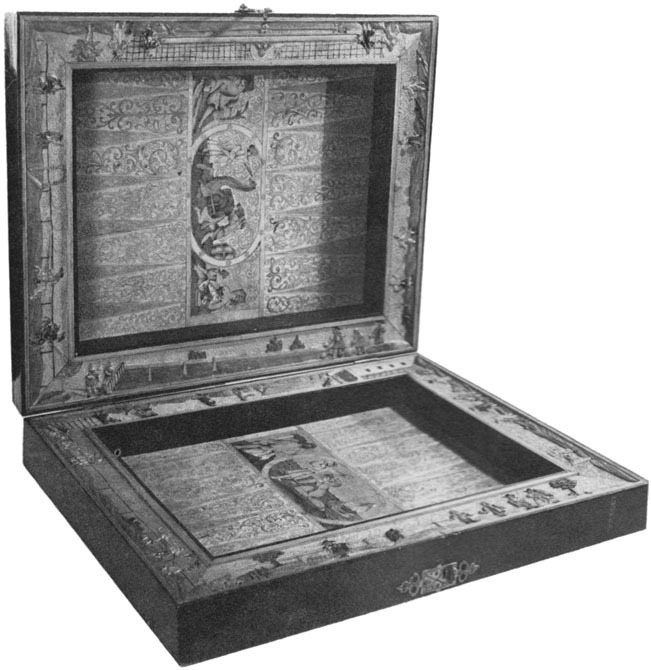 However, since people are both stubborn and resourceful, some artisans disguised backgammon boards as books — inside were dice, men, and dice boxes. The tables were turned, so to speak, in 1479. when the Duke of Albany brother of James III of Scotland, was confined in Edinburgh Castle. One night he invited the captain of the guard to supper, and they spent a jovial evening drinking, singing, and playing at tables. In the morning the royal captive had disappeared, and his jailer was dead. 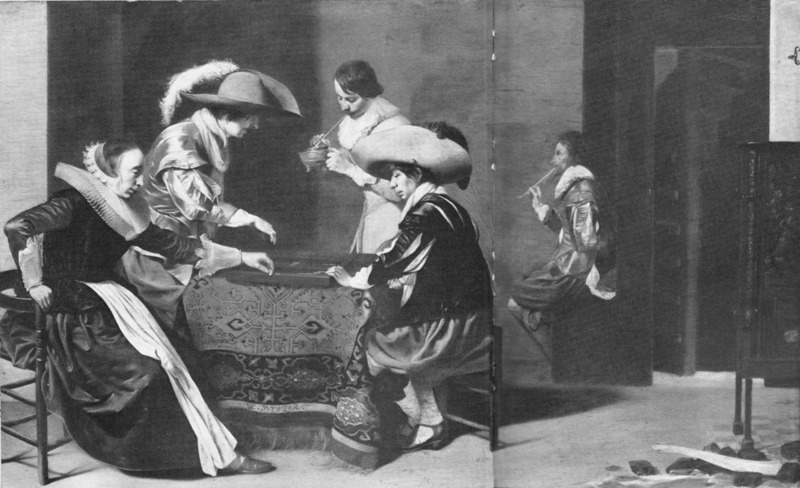 The earliest recorded use of the word “backgammon” was in 1645, according to the Oxford Universal Dictionary. H.J.R. Murray, in A History of Board Games Other Than Chess, says that backgammon, the modern form of tables, was invented in England early in the seventeenth century. 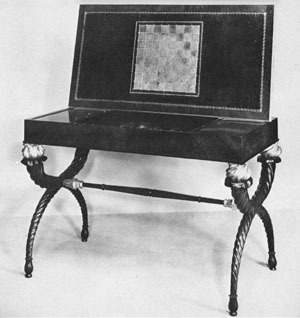 The two differences between backgammon and tables that Murray lists are slight but very interesting: in backgammon (1) doublets are now played twice, and (2) the triple game, or backgammon, is introduced and defined thus: “when the winner bears all his men before his opponent has carried all his men to his home or bearing table.” This is more like our gammon than our triple game, but it’s getting there! 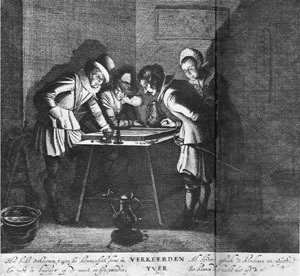 Thirteen years later Samuel Butler mentioned backgammon in his satirical epic poem Hudibras, which may be the first use of the word in English literature. Illustrations by Kenny Meadows from G. F. Pardon’s Backgammon: Its History and Practice, first published in London in 1844. There are a number of possible sources for the word “backgammon.” For example, in Welsh bach means small, and cammaun means battle. 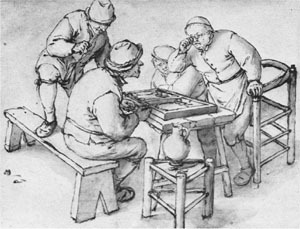 But since in many early versions of the game players began with all the men off the board, a less interesting but more plausible source is Middle English: baec means back, gamen means game — i.e., a game in which (1) you want to go back home and back off the board again, and (2) you may be forced back (to the bar) and to start over. Or perhaps it simply came from the fact that most chessboards were marked for backgammon on the back. 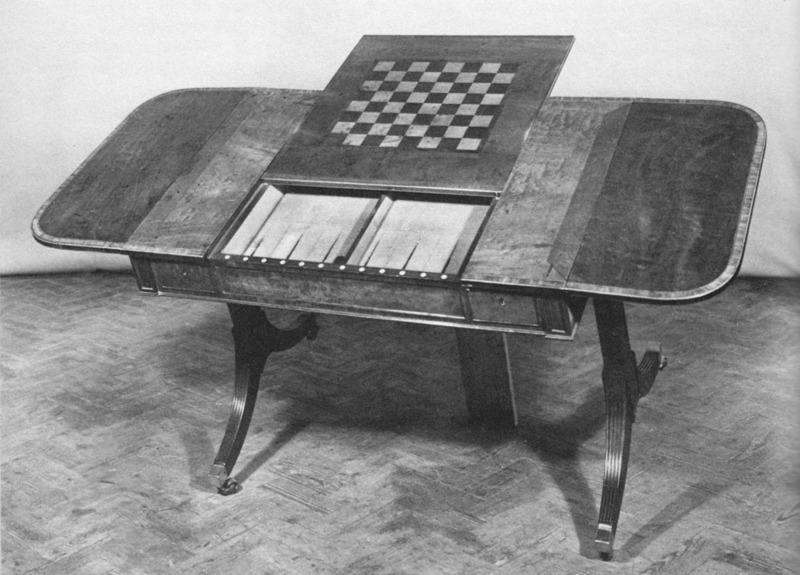 And certainly debates about hits were easier of settlement than disputes about tithes from Sir Roger de Coverley — who when he wished to obtain from the University a chaplain of piety and urbanity, in short a Christian minister, conditioned that he “should know something about backgammon.” Sir Roger was of course Addison and Steele’s fictitious country gentleman, whose exploits entertained the readers of The Spectator. Billiards, backgammon, and the vicar. 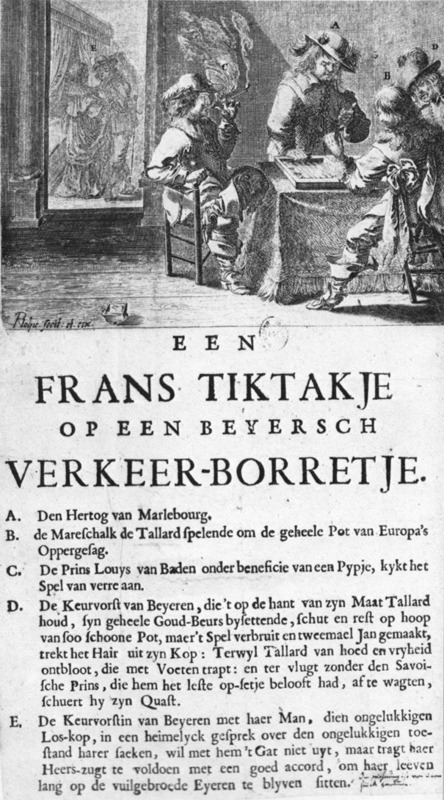 And Hoyle, of course, wrote a treatise on the game which first appeared in 1743, the year after his book on whist. In the middle of the nineteenth century a historian of games named George Frederick Pardon wrote a book on backgammon (following in the grand tradition of Hoyle, his book appeared the year after he wrote one on whist). An Altercation at the Backgammon Table. 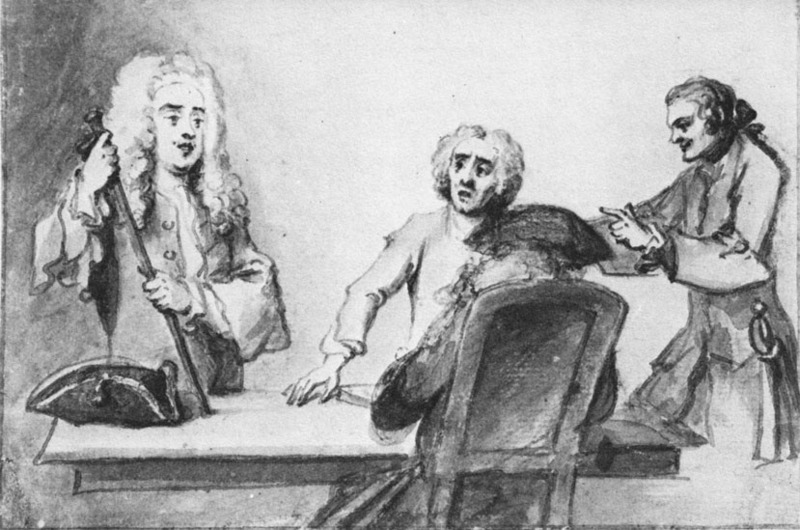 By William Hogarth, in Scenes from Burton’s Coffee House. The technical terms of backgammon may teach valuable lessons. … In the game, it is proper to “get your men to your table,” and to effect it as rapidly as possible; that teaches hospitality, brisk as its own champagne. “Cover your man” is another maxim; that shows protection must be afforded to the helpless, clothing to him “whose looped and windowed raggedness” demands payment of such charitable imposts; ’tis, moreover, to diminish the amount of poor’s-rate, by encouraging manufactures, and let political economists prescribe a better remedy. 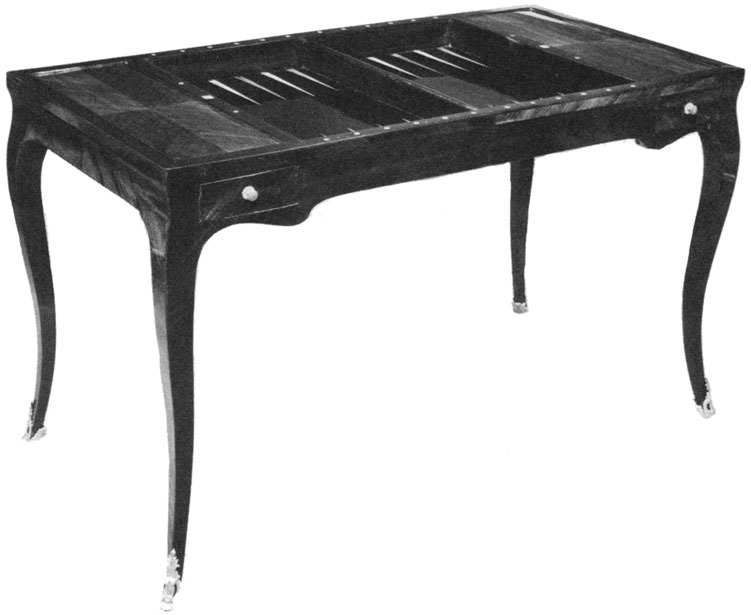 Sheraton mahogany “sofa” table, the sliding top concealing a backgammon board. 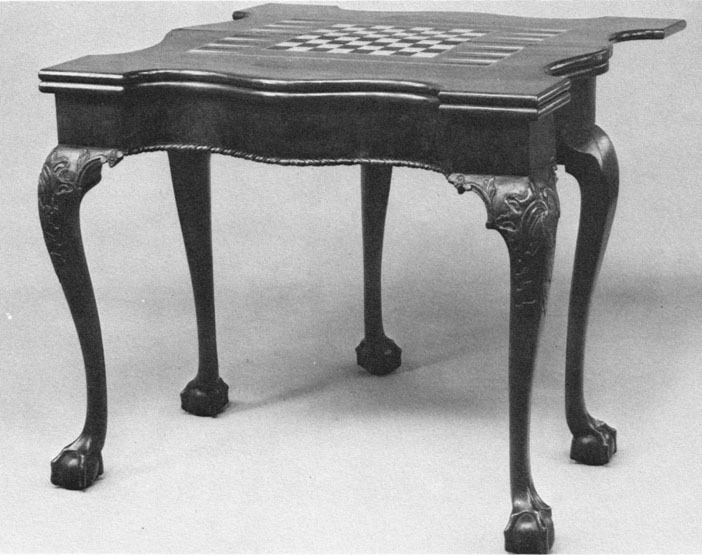 Regency rosewood gaming table, the lift-top concealing a backgammon well, on unusual cross-legs with gilt enrichments. “Get home as quickly as you can” inculcates the culture of domestic happiness: and suggests a speedy return from even the most festive scenes, in order to light up eyes that such return renders brighter than the tapers by which the loved one waits and muses. “Go back” is often said at backgammon, and should be the endeavour of the wanderer from the path of rectitude, ere the second false step has been taken. Despite Mr. Pardon (who wisely published his book under the pseudonym Captain Rawdon Crawley), the game remained a favourite of the English upper classes, and it was played constantly in the nineteenth century in their many clubs and country houses. Records survive from the mid-nineteenth century revealing that at least one of the Mississippi riverboat gamblers used a portable backgammon set to fleece victims on board the famed Natchez. In France the game has continued to be called tric trac, a phonetic name for the sound made as the men were moved around the originally wooden board. An eighteenth century French writer observed that “tric trac was a game played by old men and scholars,” although at the court of Paris it was played often and considered a game of nobility and distinction. A typical New York room of about 1810, in the Museum of the City of New York. 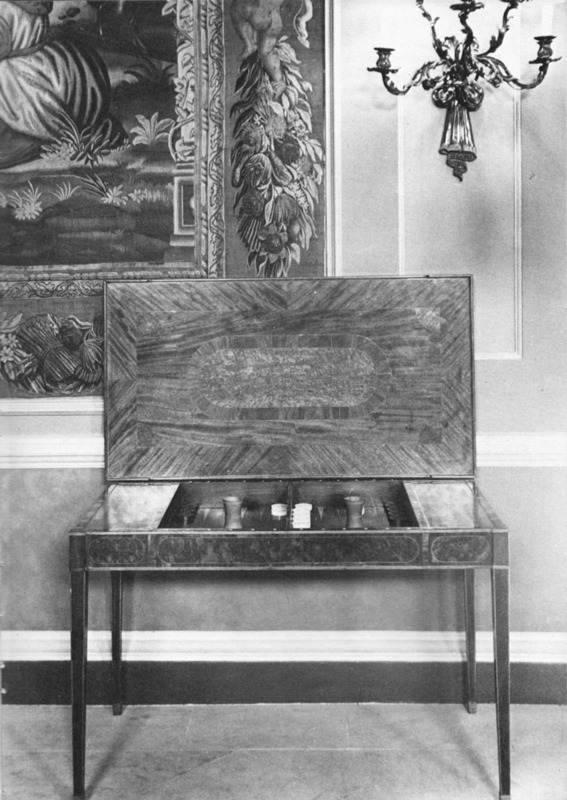 The backgammon table in the center is of mahogany and was made by Charles-Honore Lanuier, who worked in New York from 1803 to 1819. 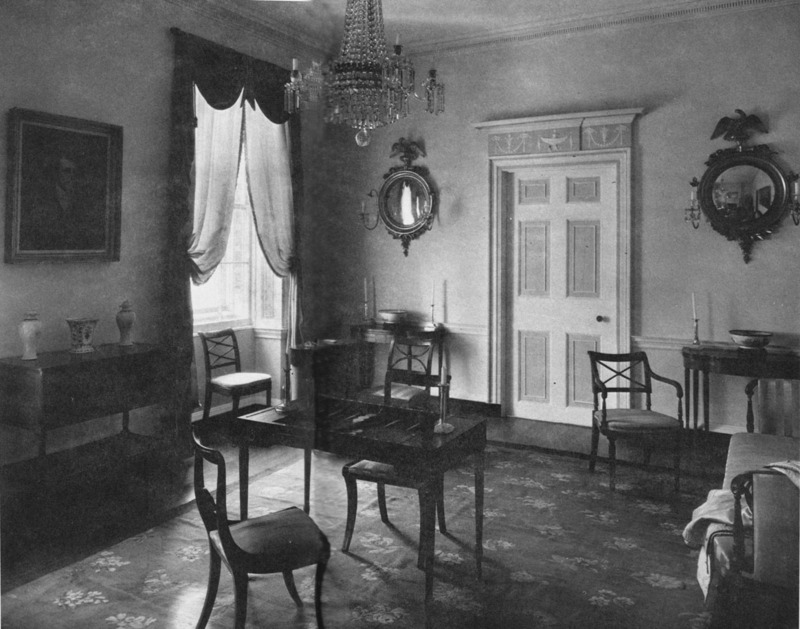 The other furniture in the room is by, or attributed to, Duncan Phyfe. A century later, during the era of Louis XVI and Marie Antoinette, specially designed tric trac tables began to appear in the homes of the French aristocracy. 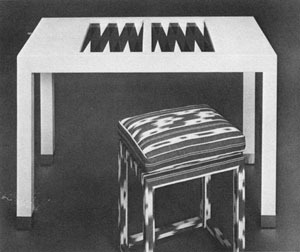 The tric-trac table looked like a small, flat desk; the centre was hollow and contained the game itself. On the sides, little holes were made to hold ivory or silver flags that indicate the points. 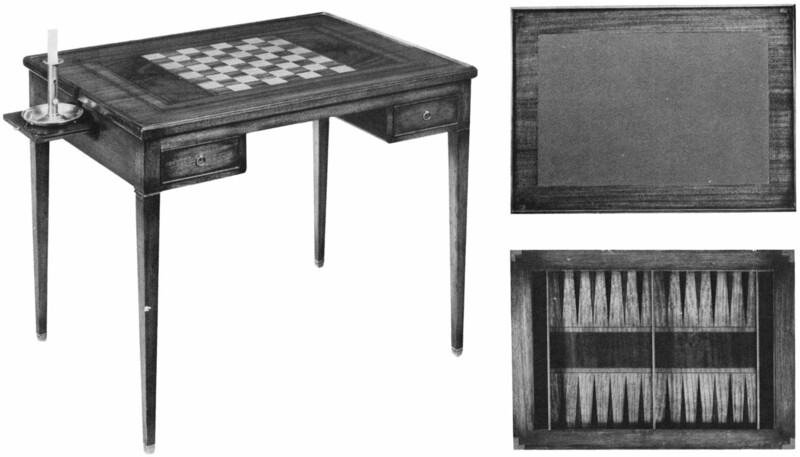 There were drawers for the pieces, the dice, and dice cups, and the top was covered with felt for playing cards on one side, and the other had a chessboard or leather surface to be used as a desk. These tables were fantastically intricate, inlaid with precious materials, and one table said to have been owned by Marie Antoinette cost 238,000 francs in gold. 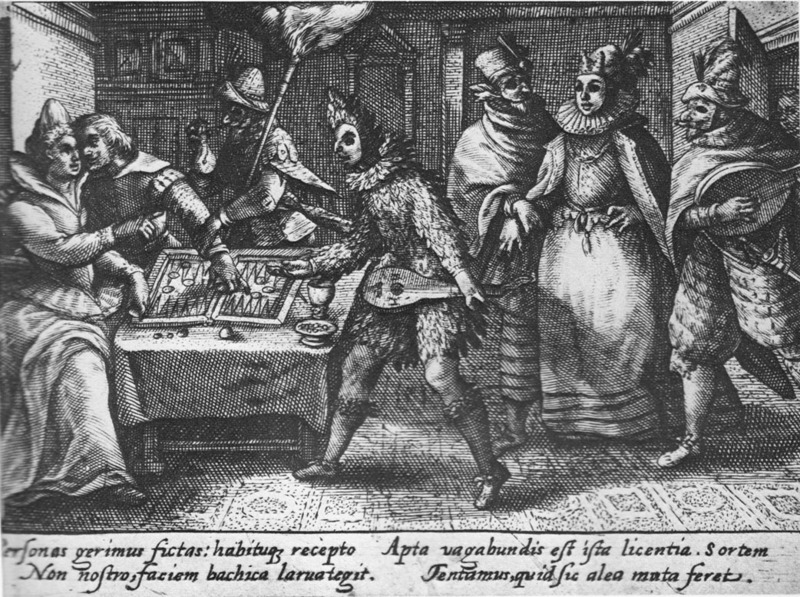 The Italians called the game “tavole reale,” and the Spanish “tables reales”; both mean “royal tables.” The Spanish are said to have learned the game from their Moorish conquerors. The Entering division and the Home are common to both players. The Entering division must he either the right-hand near division, or the left-hand opposite division. The pieces enter by throws, and all pieces must be entered before any leave the Entering division. On throwing doublets the player, after playing those doublets, is entitled to play the doublets underneath, which are always the complement of seven. Should he forget to do so, or should be not be able to do so, his opponent says — “I play your aces,” or whatever the number may be. On throwing 1, 2, the player can call for any doublets be chooses: but should he forget to do so, his opponent may say — “I play your doublets.” But this must be done after throwing his dice, but not lifting up the dice-box. This is an amusing game, not merely from the frequency of taking up, owing to the pieces all travelling in the same direction, but also from a player being permitted to play whatever his opponent cannot play; and also whatever his opponent forgets to play. The game is much longer than the ordinary backgammon, and the fluctuations of the game much greater, thus producing greater excitement. All stones are, off the board at the outset, and are entered in the same table and travel concurrently around to the same home table. Variants differ as to other rules. The first stone entered may be moved thereafter, or two men must be entered before moving. Blots may be hit at any time; usually a blot must be re-entered before any other play is legal. Doublets are used twice over, together with the doublets on the opposite faces (opposite faces of a die total seven); sometimes the opposite doublets may be used first, and sometimes the caster may roll a second time after throwing doublets. This privilege is lost if he cannot use all of his first roll, and sometimes his opponent is allowed to use what he cannot. Complementary doublets and the second roll are usually barred on the first turn. When the Spanish arrived in Mexico early in the sixteenth century, they were astounded to find the Aztecs playing a game called patolli, which has enough points in common with some ancient precursors of backgammon and similar board games in Asia that anthropologists sometimes cite the fact as evidence to support the theory that the Indian tribes of the Western Hemisphere originally migrated from Asia. A modern backgammon table. The board itself is of solid textured bronze, with points plated of polished chrome and copper; it is removable and folds on a chrome piano hinge. The table consists of tubular stainless steel ends with a case of matte black formica. 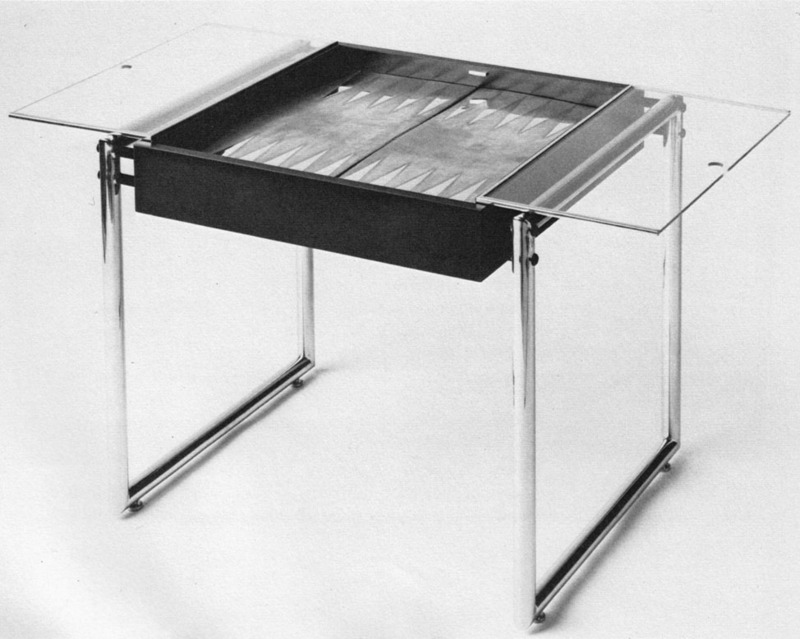 The top is clear plexiglass, and when open (as above) rests on the ends and holds game cups, ash trays, and so forth. 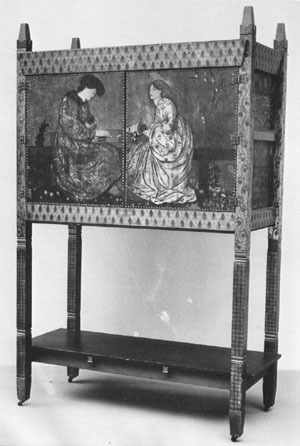 Designed by Schule-McCarville, New York; the board in collaboration with Eleanor Ward. Patolli was a game with dice, not unlike our game of ludi [Roman backgammon]. The Codex Magliabecchiano shows four players sitting on the ground or on mats round a table shaped like a cross and divided into squares. At one side there is the god Miacuilxochitl, tutelary deity of dancing, music, and gambling, watching over them. 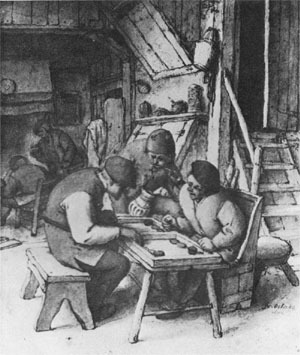 For dice the players use beans called patolli, marked with a certain number of pips; and according to the numbers thrown, they move small coloured stones from square to square on the board. The winner of the game and the stakes was the one who first came back to the square he had started from. Patolli … was the most generally played game in all classes, and in it the Indians’ passion for gambling could run unchecked. It is still played — or at least it was still played twenty years ago, among the Nahua and Totonac Indians of the Sierra de Puebla. It would be strange indeed if our game of backgammon were the only game played on the backgammon board. There are many variations, including Russian backgammon and Persian backgammon, but they are especially numerous in the Mediterranean countries. 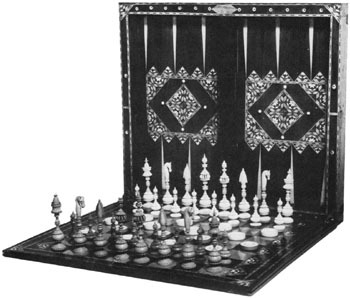 There are the Turkish games of moultezim and gioul, the Greek plakoto and eureika, and countless others, including the U.S. Navy game of acey-deucy, which originated in the Middle East. 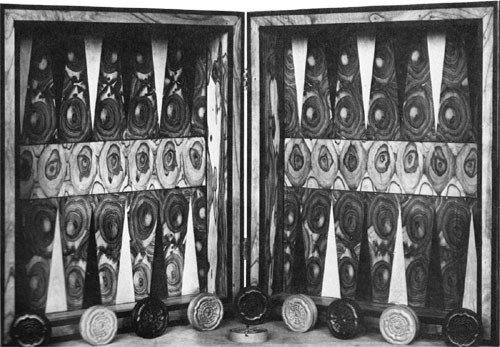 In the United States and Europe interest in backgammon greatly revived in the 1920s when some unknown genius playing in one of the American clubs came up with a revolutionary idea. He proposed that, at his turn to play, a player might insist on doubling the stakes. His opponent would have the right to refuse, in which case the game would then end and be scored at the original stake. 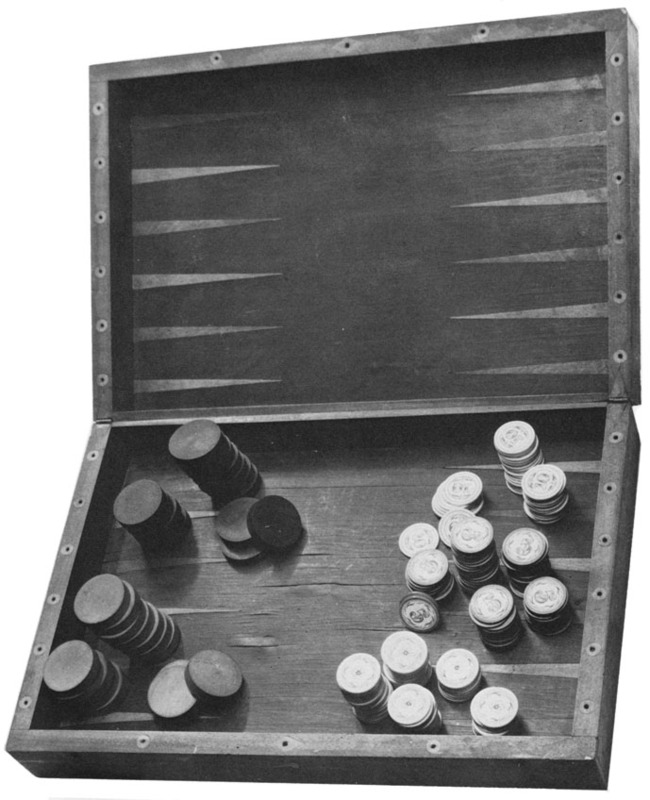 Until this simple but ingenious innovation, there were just too many games in which the outcome would pretty much be decided in the first couple of rolls — yet play would have to go on interminably, since there is always a chance of the unusual happening when the unpredictable dice are rolled. One of the gaming rooms at the Newport Reading Club in Rhode Island, said to be the oldest active club in the United States. With doubles, the game could still be boring, of course, but it would be boring at doubled stakes. More important, lots of doubles would be refused and new games started more quickly. Thus, doubling increases the risk of winning and losing, and also adds the suspense and excitement of the dare, and sometimes the bluff, to the game. This same inventive genius, or perhaps a second one, added the redoubling feature, which allows a player who has been doubled to redouble his opponent in the same manner, whenever it is his turn to roll the dice. Doubling and redoubling has really livened up the game — and we have no hesitation in saying that backgammon is now undoubtedly, the most exciting gambling game there is! After the introduction of doubling, the game rapidly began to increase in popularity among clubmen, but there was one great problem: there were no laws for the game that were of any value. 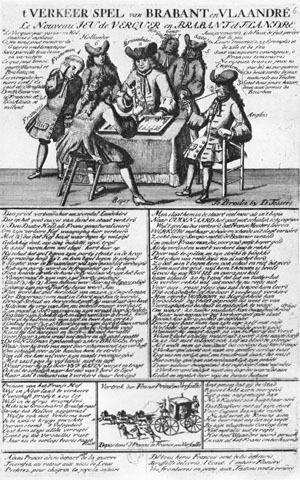 Each group settled disputed points in accord with their own best judgement, but there were no commonly accepted rules. at the rear right, turning the doubling cube to 4, is John Crawford. Among places where the game became extremely popular was New York’s Racquet and Tennis Club. 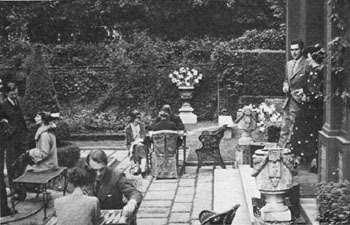 In 1931 Wheaton Vaughan, chairman of the club’s Card and Backgammon Committee, decided to undertake the task of preparing laws for the game. First be wrote to all other clubs that might be interested to ask them to send representatives to meetings. Those in the New York metropolitan area did so, and many others announced their willingness to abide by whatever laws were formulated. 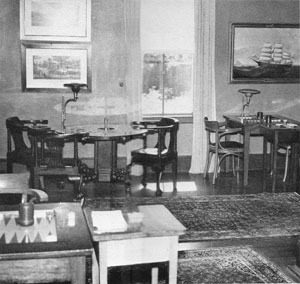 The committee met, worked, and prepared laws, which have remained the accepted rules until now. 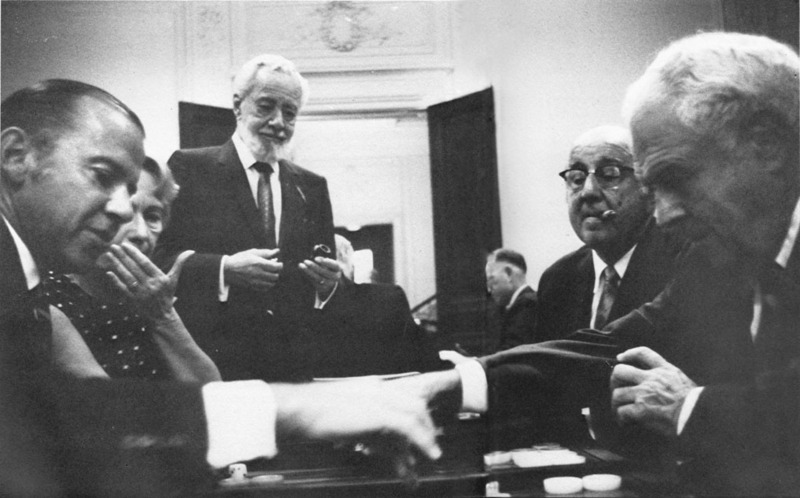 As far as we know, Oswald Jacoby is the only member of that committee still living. Those laws were good, but not perfect. Some are honoured far more in the breach than in the observance. We have taken the liberty of preparing new laws in conjunction with the International Backgammon Association and the Interclub League of New York that we hope will replace these earlier laws. 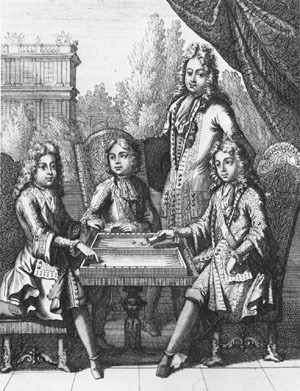 Backgammon received another boost when Prince Alexis Obolensky conceived the idea of an international backgammon tournament. This tournament has been held in the Bahamas every year since 1964. The first attracted forty entries and was won by Charles Wacker of Chicago. The next was won by John Crawford, and the following three by Oswald Jacoby, and the last two by Walter Cooke. Each year has seen more entries in the championship, and more entries in the beginners’ tournament. The idea of holding backgammon tournaments is spreading rapidly. Obolensky conducted similar events at Las Vegas, and there have been other tournaments in London and Estoril, Portugal. We’ll have more to say on tournaments, their players, and winners in Chapter 15. More and more people all over the world are taking up this wonderful game, and we hope that this book will help many more to discover the fun and excitement of playing backgammon.